Veneta Marina was established by Giampaolo Montavoci in 2002 running boats in Class 1, Class 3, Endurance, Wet-byke and Pleasure Navigation. The partnership of Montavoci and Cirilli, two experienced racers whose racing careers began in the mid-80s, proved to be the most reliable Class 1 team in 2004 and the only team to score points in every race, taking four fifth and four six place finishes to take fifth overall in the championship in GFN Gibellato. 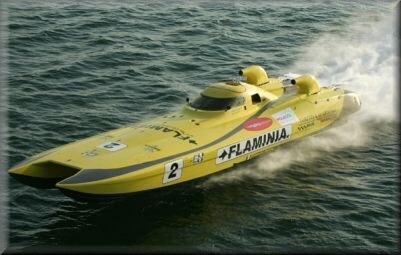 At the tail end of the 2005 season the team ran two boats, the newer and faster Victory built GFN Gibellato and the slightly older hull they ran during 2004 (Ceramiche Flaminia).